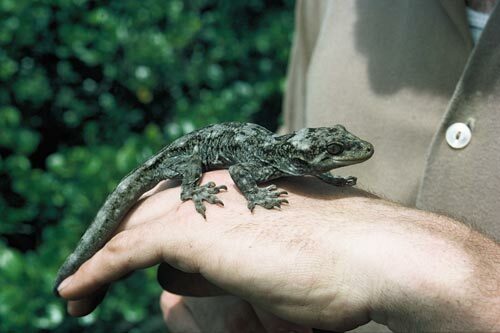 Duvaucel's gecko (Hoplodactylus duvaucelii) is the largest New Zealand gecko. The largest recorded specimens are 16 centimetres long and weigh 120 grams. They live in rocky or forested areas on offshore islands north of Cook Strait, and are nocturnal. Bones found on the North and South islands indicate that this species, like many other endemic lizards, was once much more widely distributed on the mainland.